Christine DeRosa/Pipe Dream Photographer Student groups collaborated on dragon installations in three different locations. This week, the Dragon Panel Project debuted on campus to honor women of color who have faced interpersonal, political and hate violence. The project is an art installation that aims to raise awareness for this growing international issue, prompting Binghamton University students to share stories of violence victims who might not have a voice. BU is one of the first colleges to participate in the project. It was founded by Rachel Carey-Harper, a visual artist who advocates for the safety of women. She also founded the Clothesline Project, a popular visual project used by many colleges including BU, to raise awareness for domestic violence. 20:1 Prevention Programs (20:1), Real Education About College Health (REACH), Mental Health Outreach Peer Educators (M-HOPE), the Multicultural Resource Center (MRC), the Q Center and other student groups helped create the panels, which were hooked together to form a different dragon at each location the project was displayed. Health Promotion and Prevention Services, 20:1, the MRC and the Q Center sponsored the Dragon Panel Project. The project usually looks at interpersonal violence on a national scale, but Mackenzie White, a 20:1 intern and a junior majoring in nursing, said BU expanded the project to recognize victims beyond America. 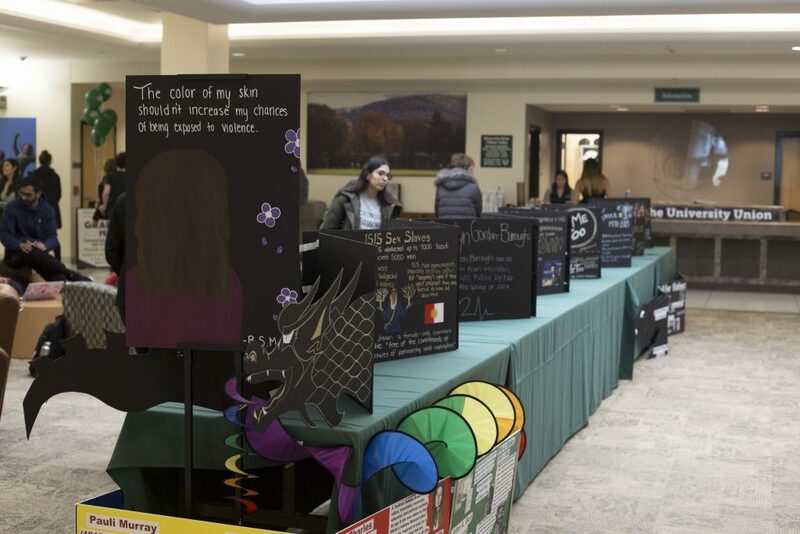 The panels consisted of black foam boards which featured a woman or a group of women of color to honor those who have died due to interpersonal violence. They included pictures of victims, statistics about missing and murdered women and powerful phrases and quotes written in metallic marker. Alfi Amin, a 20:1 intern and junior majoring in psychology, said the process of creating the panels was an emotional experience. White said she had a similar experience. The panels are featured at the University Downtown Center (UDC), the School of Pharmacy and Pharmaceutical Sciences (SOPPS), Glenn G. Bartle Library and the Tillman Lobby in the University Union. White said the locations of the panels were intentional so a diverse group of students could view them. The project is on display from Tuesday, April 2 to Thursday, April 4 at various locations on campus. The UDC also hosted an opening reception Wednesday evening, which introduced the project and discussed its aim to raise awareness. Carey-Harper spoke at the reception and visited campus on Wednesday to view the project. White said she hopes people take the project seriously and connect with the stories shared through the panels. Amin said she hopes the project will expand to more colleges so it can influence the younger generations.